While MillersCoors CCO Pete Marino describes Bud Light's claims as "misguided, misleading and desperate," the spat reflects how brands are increasingly willing to call each other out on social media. Despite inflaming farmers and competitors with its Super Bowl ad, Bud Light hasn’t budged much from the tactics that saw it brag about not using corn syrup in its beer, while mocking Miller Lite and Coors Light for having it in theirs. And don’t be surprised if we see others using a similar strategy — calling out competitors — in the near future. “More so than in any other year, we’re seeing more and more brands respond to each other,” said BCW global president Jim Joseph, who keeps close watch on the marketing surrounding the Super Bowl, the most recent of which was played on Sunday. “The latest banter between Bud Light and MillerCoors, sparked by Super Bowl advertising, is a shining example of brand to brand interaction, whether competitive or otherwise. I think we’ll see this dialogue continue to play into other arenas as well, and in other categories,” he said. While Bud Light, owned by AB InBev, took a baby step toward addressing the flap with an attempt at humor in its latest Twitter post, the move was some way removed from full damage control. The tweet came in the form of a letter from the brand’s medieval King John Barley IV, who professes his love of corn despite being that guy who, in the ad, helps return giant vats of corn syrup to Miller Lite and Coors Light kingdoms. The same day, however, Bud Light continued the public sparring with MillerCoors that has ensued since the ad, which MillerCoors and the National Corn Growers Association have described as misleading. 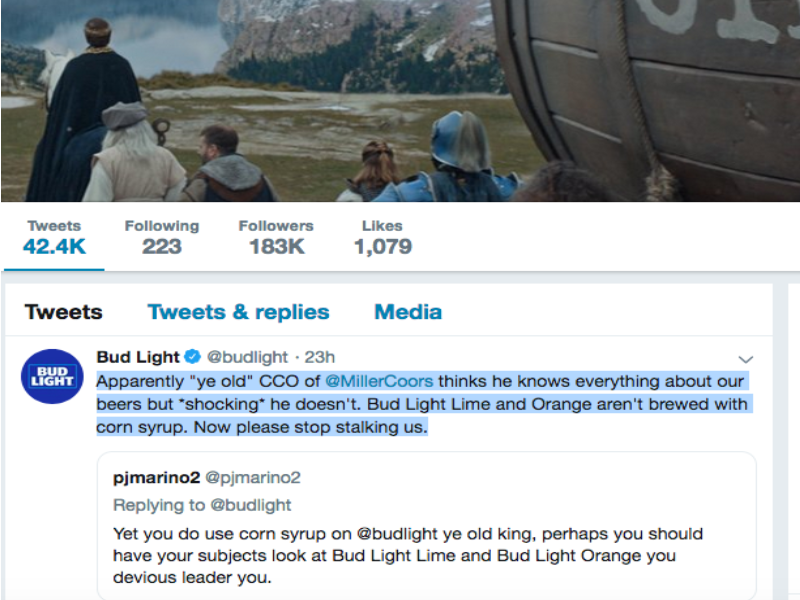 Specifically, whoever is behind the @budlight account (and we don’t know because the brand declined to clarify) took jabs at MillerCoors CCO Pete Marino over his assertion that Bud Light does, in fact, use corn syrup in its lime and orange-flavored brews. None of which MillerCoors, nor the corn farmers, are taking in jest. The brewer ran a full-page ad in the New York Times on Tuesday, in which it thanked Bud Light for making its use of corn syrup known to a national audience. “You see, the ‘corn syrup’ we source from America’s heartland helps make Miller Lite taste so great,” the ad said. It went on to point out the distinction between the high fructose corn syrup that raises health concerns and the corn syrup MillerCoors uses in its beer. The company’s stance has been backed up by the numerous reports since the ad ran, citing experts who say that it doesn’t matter whether or not corn syrup is on the ingredient list. Sugar, no matter the source, is converted into alcohol during the beer fermenting process. “To use a tactic like this that was intentionally created to mislead consumers that corn syrup is somehow bad when it’s not even found in the finished product is staggering,” Marino said. In the days since, chairman Pete Coors showed up at a corn growers event in Denver, complete with a delivery of the family brew for attendees. Next, the farmers took a road trip of their own to the Coors brewery in nearby Golden. “I think it’s a misguided, misleading and desperate attempt by the largest beer brand in the country to make an issue about a brewing ingredient that is not only used by hundreds of brewers around the country, but one they also use in their own portfolio, including their own Bud Light family with Bud Light Lime and Bud Light Orange,” Marino told the Holmes Report. Bud Light, however, refutes that, telling Holmes Report that the "campaign has always been about transparency and giving consumers what they want." "While Bud Light has never used corn syrup, Anheuser-Busch does use it in certain value brands, which are driven by price. Anheuser-Busch proudly supports farmers and the agricultural community. We source our ingredients from U.S. farmers, including 98% of our barley, 100% of our rice and all of our corn – for a total investment of $5.5 billion over the past 10 years. Last year, Anheuser-Busch purchased more than 1 billion pounds of corn ingredients. We fully support corn growers and will continue to invest in the corn industry," an Anheuser-Busch spokesperson said.